In some forest stands, development begins with a severe disturbance; hence, the developing plant community is generally even aged. When less severe disturbances affect forests, the result is often mixtures of age classes that may be intermingled spatially or dispersed in clumps (see Figure 5).These uneven aged or multi aged stands are often more complex than even aged stands because rates of growth affecting each age class differ. Similarities include the processes of trees getting larger, but declining in numbers, and continual competition for resources or growing space. Stages of stand development can be classified by key stand structures and processes typical of each stage (as illustrated in Figure 6), although patterns of stand development vary by species and site. Stand structure includes the horizontal and vertical distribution of forest elements, including the heights and diameters of live and dead trees and the arrangement of foliage, crown layers, shrubs, herbs, and down wood. Although such classifica tion methods can help link ecosystem processes and stand development, they also have limitations because they group continuous variables like diameter and foliage distribution, light conditions, and inter and intraspecific competition into categories. Patterns of development are discernable in forests of all latitudes, but the rate of change varies with available resources and along gradi ents of temperature and moisture. 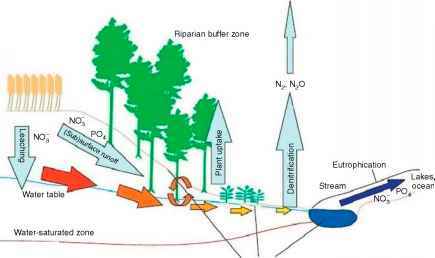 Disturbances redistribute carbon in a system and influ ence resource availability. They can occur at the scale of an individual tree or be much larger. Understanding the disturbance regime under which a forest evolved can provide important information on the possible continuum of intensity, frequency, and severity of management treat ments. Scientific debate exists on the relation between disturbance frequency and biodiversity. A contemporary proposition is that silvicultural practices patterned on natural disturbance dynamics may conserve biodiversity in managed landscapes.